BMERT commentary by Eugene Stockton: The time has come for us priests to re-invent ourselves! While parish priest of Riverstone, I became interested in contemplative prayer (Stockton 1998). It seemed to me that the lifestyle most appropriate to contemplation was that of a hermit (Stockton 2000). In 1999 I had the opportunity of study leave in the United Kingdom where I knew there had been longer contemporary experience of the solitary life and in 2000 I published my report on "Lay Hermits". This study was followed up by further reading and correspondence, while trying out this way of life as best I could in parish ministry. 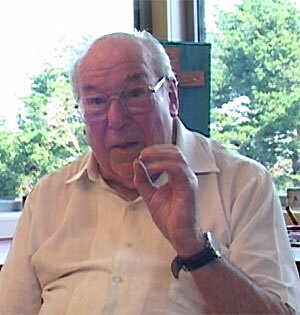 Retirement in 2001 allowed a more serious trial. Taking diocesan vows as a consecrated hermit appeals to me as a deeper involvement in my diocese and as an extension of my vocation as a diocesan priest. Fr Eugene Stockton pictured in his hermitage study overlooking his garden in the Blue Mountains. My experience has been, since taking up this way of life and having it sealed officially by the Church, that it has opened up a whole new way of life in what should be my retirement. It has given me something to live for, something to work for – without being concerned about pleasing myself (for the retiree a subtle slavery). I am able to fulfil the spiritual aspirations of my young days, under the formula quoted in "Lay Hermits", seeking to live with God alone and for God alone. I can face up to death in a robust healthy way. The consecration, – vows and plan of life make what is already a way of life into something more definite and concrete and committed. I suspect that many people in my age group would welcome such an alternative lifestyle, with renewed commitment and dedication, appropriate to the reduced capabilities of their age. Many I know opt to become Oblates –; "Third Order" or affiliates of Religious Orders – but that clashes with a sense of positive vocation to the lay state. In my own case I am definitely not called to be a religious (priest, brother or nun in a religious community); my place in the Church is definitely as a secular priest or "ordained layman" belonging to a diocese, under a bishop. Couples can see positive value in their marriage, committed to God though each other. Solos are already living on their own and can view their aloneness not as a necessity to put up with, but a state to be embraced before God. Ex-priests and ex-religious, instead of looking back on a "failure" of earlier years, could see in this way of life a second chance to pursue the ideals of their youth. People can live as hermits or "forest dwellers" in a private way, but if they opt for consecration according to the Church's current Canon Law [Canon 603] they enjoy a definite place in the Church, with a definite structure of rule and vows. The hermit way of life has a long tradition in the Christian Church, both east and west. But it could well borrow from the wisdom of Eastern religions, which provide for something lacking in the West, namely how to take account of retirement/old age. Are we to be just left on the shelf, waiting to die? The third stage on retirement is not the end, but a new stage on the journey of life and one looking forward to the final graduation. Such a forest dweller corresponds to the hermit or recluse, living a virtually solitary life. The separation from the world, effected more or less obviously in a material sense, is at depth more crucially a mental or spiritual separation. Paul Gurr wisely observed it is really how one sees oneself [Stockton, E. 2000:48]. One lives in the world with a certain objective detachment, able to look out on the world and its concerns with wisdom and compassion, without being embroiled in the passion of its causes. What is important for a person so called is not to strive to conform to a certain definition of hermit, but to seek to answer the call to be alone with God in the given conditions of his/her life [Stockton 2000:49]. One embraces one's "aloneness" as a positive value, and the proximity of death as a next step ("Saint", union-with-God). One loves one's home, a miniature kingdom of God, as a monk regards his cell or a hermit his hermitage: the place of encounter with God. The daily routine is not a chore but the opportunity to exercise what Buddhists call mindfulness. One may aspire to be no more than an ordinary human being, neither "a holy Joe" nor "a spiritual athlete". One who is not religiously inclined may, with necessary changes, still opt to be a secular hermit, of which there have been notable examples in the past [Sinetar 1986; France 1996]. The solitary vocation can fit a whole range of spiritual self-perceptions, without drawing adverse judgements from others. Down through the ages hermits, without betrayal of their calling, have often been engaged in socially useful endeavours: maintenance of a bridge or road, lighthouse keeper, counsellor, the Russian poustinik or staretz ready to help at harvest time [Wolters1972: 18-19; de Hueck Doherty 1975:37-47]. Thomas Merton is a famous modern example of a hermit busy in correspondence, conferences and writing. Priests may have a busy round of parish supplies. I find academic research and writing very conducive to my way of life. As mentioned already, it comes down to how one perceives oneself in the world: in the world but not of it. I believe some dedication or commitment is the key to a full life, as opposed to the "unreflected life", which the Greek philosopher called "no life at all". There are those who are totally dedicated to wealth, power, fame, career etc that ultimately comes down to dedication to the Self. Then there is the dedication, which takes one out of oneself – dedication to family, the poor, beauty, truth etc, which ultimately is dedication to the Totally Other, to God. In the Church, God-ward dedication is formalised into different vocations – priest, religious and layperson. Each vocation may entail various stages until one is the "full blown" priest, religious etc. But no or little account is made of retirement, old age or death. What does it mean to be a priest of the Third Age? What does my priestly vocation call me to now, at my age, when 1 am no longer useful? The "forest dweller" borrowed from Hindu asceticism can usefully fill this gap, without the negative association in people's mind of "Consecrated Hermit" or "Consecrated Virgin" (in the language of current Canon Law). Eugene Stockton, originally written in 2008. Doherty, Catherine de Hueck, 1975. Poustinia, Notre Dame Press, Indiana. France, Peter, 1996. Hermits: The Insights of Solitude. Chatto and Windus, London. Merton, Thomas, 1971. Contemplation in a World of Action. Double Day, Garden City, NY. Sinetar, Marsha, 1986. Ordinary People as Monks and Mystics: Lifestyle for Self-discovery. Paulist Press, NY. Stockton, Eugene, 1995. The Aboriginal Gift: Spirituality of a Nation. Millennium Books, Alexandria. 1998. Wonder. A Way to God, St Pauls, Strathfield. 2000. Lay Hermits. Compass 2/24: 46-50. Wolters, Clifton, 1972. (Trans, of Richard Rolle's) The Fire of Love. Penguin Books, London. 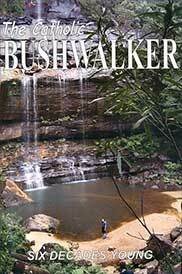 One of Four Books by Jim Barrett recording the history of the Catholic Bushwalking Club.